Amherst Biennial: Eric Carle & Biennial Artists - Preview in Amherst Bulletin! Eric Carle & Biennial Artists - Preview in Amherst Bulletin! This morning I was up at the crack of dawn to help the artists, Carl Calvano (pictured left) and Sandy Litchfield install at the Carle Museum. Curator and Founding Director Nick Clark gave us a private tour of the galleries. It was wonderful to how Eric Carle's independent work had similarities.to Calvano's arwork. 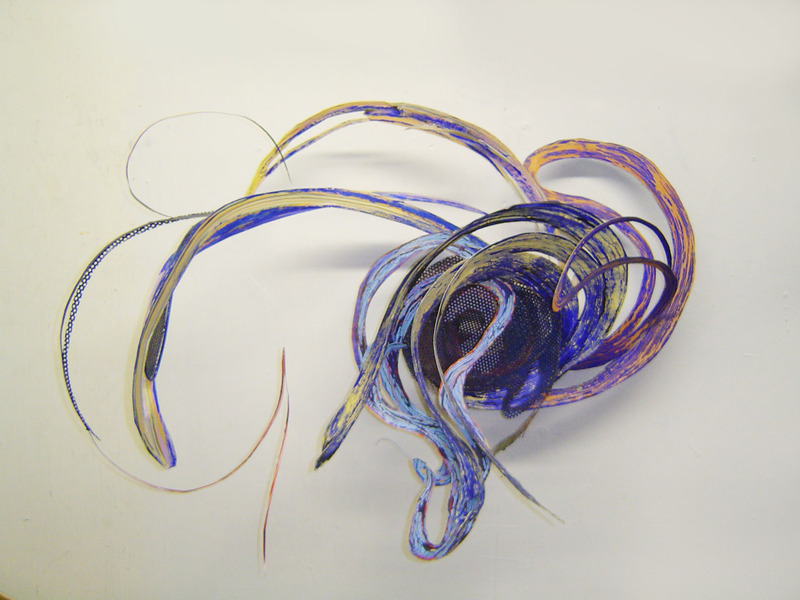 Both Carl and Eric both have used use sculpted painted metal in their art work. Sandy's renderings of buildings appeared in another artist's drawings in the first gallery. It's wonderful to see the links between the artists. After I can home to continue production on the Biennial, I picked up my morning paper and read this wonderful article in the Amherst Bulletin. Just a reminder you can get a sneak peek of the Biennial at a dozen sites tonight. Hope to see most of you this weekend for the grand opening starting at the Hitchcock Center a little earlier since the installations are outdoors, you can see Nancy Milliken & Chris Nelson's pieces from 4 - 6 PM. Hi - The Bienniel sounds awesome! Where can I find a list of performances and their location for this Saturday's opening? Karen Dolmanisth will have a closing performance on Nov. 30th at noon and will be the artist-in-residence installing her site-specific work at Stearns Steeple in front of the Mead Art Museum most weekends. Samuel Rowlett will be doing his performance of Expanded View of the Landscape (carrying his very large canvas on his back) will be rescheduled soon.